Mr P and I have had our difficulties in the past. I was fairly horrified by his Measure for Measure, underwhelmed by his Tempest, and just couldn't get into his Macbeth (yes, the one everyone and their brother raved about). But then came a perfect Arcadia, and last year I couldn't get enough of Orestes. Had the tide turned? Were Mr P and I finally to be friends? Would his Comedy of Errors make me recant my professed wariness and fall into line with the majority of DC theatregoers? One the one hand, Posner has assembled a fantastic cast and while this isn't my first commedia dell'arte inspired Comedy, you can't deny that it really works for the play. Combine Aaron Cromie's masks and the finely tuned physicality of the ensemble's performances and suddenly, Shakespeare's play of mistaken identities works a heap better than you'd ever expect. As the two Dromios, Nathan Keepers and Darius Pierce look nothing alike... until you add Cromie's masks, Kate Turner-Walker's costumes, and a carefully crafted physical performance. It took me a few scenes before I could tell the two men apart and that's a tribute to how beautifully this concept can work for the play, as well as to the talents on display. 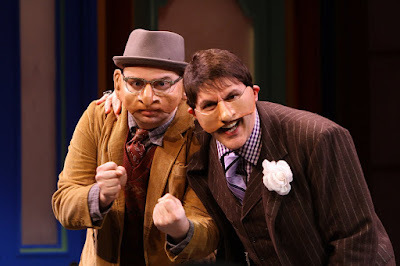 (L-R) Domio of Ephesus (Darius Pierce) with his master, Antipholus of Ephesus (Bruce Nelson), in The Comedy of Errors, on stage at Folger Theatre through March 6, 2011. Indeed, there's a fantastic level of commitment in this cast. There's a not a weak link in the bunch, although special praise must go to Keepers, Pierce, and Suzanne O'Donnell's Adriana (and a special-special nod to Rachel Zampelli's "effortlessly" funny, scene-stealing Courtesan). The humor is big and broad and I had a blast- it's a show full of fantastic performances that bring this strange, kooky play to life. Tony Cisek, who designed a dark and moody set that fed directly into the machinations and manipulations of the Folger's Henry VIII this fall , this time gives us the exact opposite. 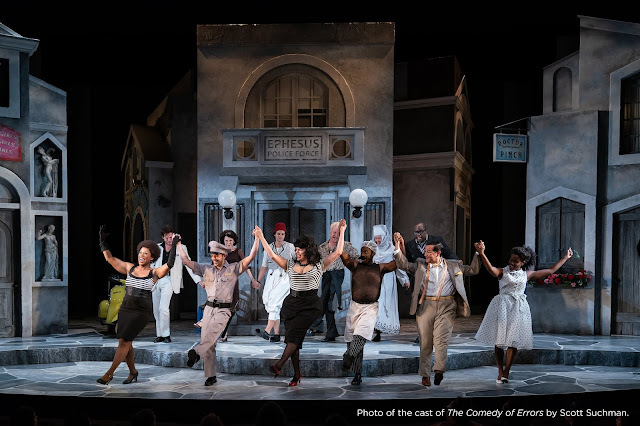 Cisek has produced a candy-colored shopping arcade of a set, filled with doors of different shapes and sizes that called to mind both classic farce and the scaenae frons of the Roman theatre from which Shakespeare stole the plot of Comedy. Turner-Walker's costumes are half Edwardian, half topsy-turvy fun and fit right into the world created by Cisek and Posner. So it sounds like Mr P and I might have resolved our problems and that I enjoyed myself thoroughly- and I did! What I haven't talked about is the SECOND concept Mr P has strapped on top of this Comedy, because apparently a solid and splendidly funny commedia take wasn't enough. No, because this is what HAPPENS when Mr P does Shakespeare- he's got to mix it all up and put his stamp on and make it HIS show, not Shakespeare's. This time, Mr P has added a frame to the play that only matters for the first 15 minutes of the evening. If he EVER revisited it during the show in any way other than through the design, it might have worked, but as it stands? Utterly unnecessary. In fact, the frame introduction went on so long that I quickly became frustrated and half-wanted to yell out 'GET TO THE BLOODY PLAY, ALREADY.' If I were wearing my pretentious pants today, I might call this a sad attempt to mimic the Christopher Sly induction to Taming of the Shrew, but hey- my pretentious pants are in the laundry (I tossed them in after that scaenae frons reference). Instead, I'll just say that it's not worth the time spent- the play DOESN'T NEED IT and this production sure as hell didn't need it either. If I could take a giant pair of magic reality-altering scissors, I would snip out that 15 minutes and just bestow the rest of Mr P's production with a happy sigh unto the audience. Yes it's all well and good to extend your subject material's Fun with Double Identities a little further, but not when you do it Just Because. That's not clever, that's half-assed. FAST ASIDE- I sat next to a gentleman on Sunday night who took out his cellphone three minutes into the show and proceeded to CHECK HIS GD EMAIL for the ENTIRE FIRST HALF. He may have turned the brightness of the display down, but my ire was at FULL FORCE. Withering glances had no impact upon his galling audacity. He moved at intermission to a different seat out of my direct line of sight, but JEEZY CREEZY, sir. If you don't want to actually watch a play, DON'T GO TO THE THEATRE. It's bad enough when the teenagers I work with constantly whip out their phones, but when adults can't behave themselves either, I WEEP for AMERICA. Posner's Comedy of Errors is delightful. His cast is superb and throw themselves into the play with a panache that is a joy to watch, and his design team have created a sparkling, shiny world in which I'd like to play around myself. I just wish Mr P had trusted Shakespeare's play a skosh more and reveled in his cleverness a mite less. I DO think you should get your tuckus down to the Folger for this play... but don't be concerned about getting there early. A late seating break might be just what the blogosphere ordered.